For all those trendy women desiring to experiment with hair extensions, weave hair extensions is just what “the doctor ordered”. These types of hair extensions are also called sew in or braided hair extensions. Types of Hair extensions – weave hair- how to apply them? The wefts of these extensions are sewn into the braids of a client’s hair (after creating a base) with the help of a thread and needle. Still have a question what is wave hair? Weave hair extensions allow you the liberty to choose from a vast range of colors, textures and shades (to exactly match with your natural hair). However, just like any other hair extension, you must know about weave hair extensions pros and cons before you opt for them. +This is one of the most harmless ways to extend your hair. A vertical braid (created across your head holds all the attached hair). The entire apparatus only affects the hair it is attached to. +Sew in hair extensions don’t slip (unless the braids get loose somehow). You can use silicone or oil based hair care product with these types of hair extensions. +Sew in extensions are low maintenance and last upward of 6 months. +You can use them with all types of hair, though they are most suitable for coarse and thick hair. +You would not need glue or heat to apply these types of hair extensions. +You desire to increase the length of your natural hair and you are ready to let these extensions in place for no less than a couple of months. - Sew in hair extensions have a long application time (up to several hours). - if you hair is silky straight, when you braid it in for the sew in.. it may not last very long.. which in that case isn't good. 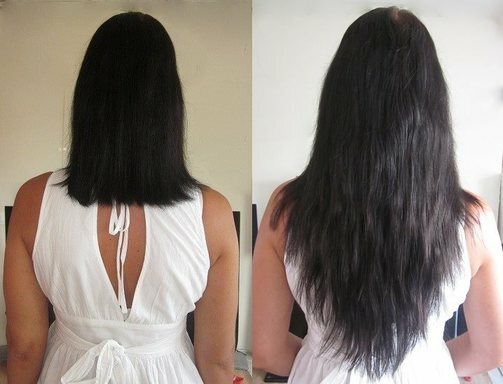 - Sew in hair extensions can cause discomfort and headache in certain cases. - Tight braids can be a cause of traction alopecia or tension in rare cases. Your stylist charges and the quality of sew in or braided extensions would decide the cost factor. Washing your hair at regular intervals, avoiding over styling can help your sew in extensions to last longer (as this causes the braids to loosen up). Brushing your hair regularly (root to tip), shampooing, blow drying and curling won’t affect your sew in extensions negatively.